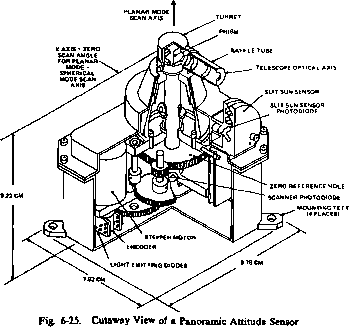 Detectors which respond to the longer wavelengths of infrared blackbody radiation are based on the operating principles of the thermistor, thermocouple, or pyroelectric crystal [Barnes Engineering Co., 1976]. A bolometer is a very sensitive resistance thermometer, or thermistor, used to detect infrared radiation. Thermistors consist of fused conglomerates, or sinters, of manganese, cobalt, and nickel oxide formed into flakes, typically 0.5 mm by 0.5 mm by 10 pm thick, bonded to a heat-dissipating substrate or heat sink. Impinging radiation heats the flake and alters the resistance, typically by 3.5%/°K, which is sensed by conversion to a voltage and amplification. When radiation is removed from the flake, its temperature returns to that of the heat sink with a time constant depending on the thermal conductance of the flake-substrate bond. A typical time constant is 3 ms. Bolometers are able to sense temperature changes of 0.001 °K due to radiation despite ambient temperature changes four orders of magnitude greater [Astheimer, 1976], The minute temperature change is observed by modulating the incoming radiation by, for example, scanning across the target, and thereby removing the effect of ambient temperature changes on the output voltage by capacitance coupling to the amplifier. A bolometer may have either one or two flakes in the focal plane of the optical system. The two flakes of a dual-flake system detect radiance originating from different regions of the celestial sphere. Consequently, the two output signals may be combined in an electronic AND circuit to provide Sun rejection if the separation between the flakes is such that the Sun cannot be seen by both flakes simultaneously. Thermistors are often immersed in or surrounded by a germanium lens (transparent to infrared radiation) to increase the intensity of radiation at the thermistor. A thermopile consists of a string of thermocouple junctions connected in series. Each thermocouple consists of a hot junction and a cold junction. The hot junctions are insulated from a heat sink and coated with a blackening agent to reduce reflection. The cold junctions are connected direcdy to a heat sink. When exposed to impinging infrared radiation, the hot junction is heated and yields a measurable output voltage. Thermocouple junctions commonly use bismuth and antimony. Thermopile detectors are simple, requiring minimal electronics and no moving parts; however, they suffer from a slow response time and are used only in nonscanning systems. Pyroelectric detectors consist of a thin crystal slab, such as triglycine sulfate, sandwiched between two electrodes. Impinging radiation raises the temperature of the crystal, causes spontaneous charge polarization of the crystal material, and yields a measurable potential difference across the electrodes. Pyroelectric detectors may be used in scanning systems because they are fast and have a high signal-to-noise ratio with no low-frequency noise. The output from a scanning horizon sensor is a measure of the time between the sensing of a reference direction and the electronic pulse generated when the radiance detector output reaches or falls below a selected threshold. The reference direction for a body-mounted sensor is generally a Sun pulse from a separate sensor, whereas wheel-mounted sensors typically use a magnetic pickoff fixed in the. body. If the detector output is increasing across the threshold, the pulse corresponds to a dark-to-light transition or acquisition of signal (AOS). If the detector output is decreasing across the threshold, the pulse corresponds to a light-to-dark transition or loss of signal (LOS), the AOS and LOS pulses are also referred to as in-crossings and out-crossings, or in-triggering and out-triggering, respectively. •The negative of the reference to midscan time is the split-to-index lime. The simplest horizon sensor system is a body-mounted horizon sensor sensitive to visible light Such a system consists of an aperture and lens to define the field of view and a photodiode to indicate the presence of a lit body. Body-mounted sensors are cheap and reliable and have been used on IMP; slightly more complex versions, sensitive to the infrared spectrum, have been used on AE, SMS/GOES, CTS, and SI RIO. 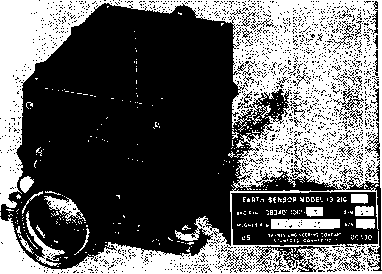 A body-mounted infrared sensor is shown in Fig. 6-23. Body-mounted sensors are suitable only for spinning spacecraft and their fixed mounting angle makes target acquisition a substantial problem for many missions. In this subsection we describe the operating principles of several more versatile sensor systems that have been used operationally. 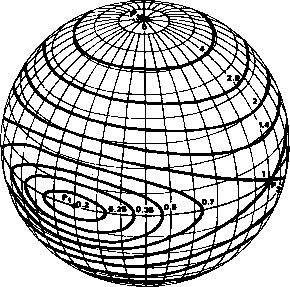 tr spherical mode are the times from the Sun pulse to AOS and LOS. The threshold for detection is specified as 0.1 times the maximum lunar radiance, which corresponds to a first- or third-quarter Moon as viewed from the vicinity of the Earth. When the spacecraft is despun, the scanning motion in the planar mode is accomplished by rapidly stepping the turret. Various commands are available to control the operation of the PAS in both the spherical and the planar modes. The turret can be commanded to step continuously in either direction, to reverse directions at specified limit angles, or to inhibit stepping altogether. The detector records and stores, in a series of registers, the encoded steps at each dark-to-light or light-to-dark transition. The telescope is baffled to prevent detection of the Sun at separation angles between the telescope axis and the Sun of 12 deg or more.